LEGO Hero Factory SURGE features powerful rotating lightning blades, dual plasma shooters, jetpack wings, opening armored visor…. Report for duty Stormer – Lego Hero Factory is under attack by the evil brains and we need all heroes on deck. LEGO model number: 44010: We’ve equiped you with a nano alloy sword with ice fangs, and ice hero shield, an ice missile launcher, an armoured visor and hero core locking clamps so you’re ready for battle. For ages 7 years and over; EAN: 5702014975002. WARNING(S): Not suitable for children under 3 years old. To be used under the direct supervision of an adult. Attention SURGE: The evil brains are closing in on LEGO Hero Factory HQ and must be stopped! We’ve equipped you with powerful rotating lightning blades, dual plasma shooters, jetpack wings, an opening armored visor and hero core locking clamps. Now spin those lightening blades and give the aliens a shock they’ll never forget! 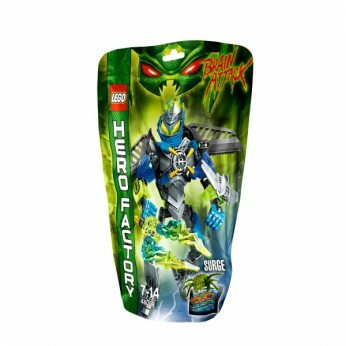 This toy costs approximately £9.99 (for the latest and best prices make sure you check our retailer list for the LEGO Hero Factory Surge 44008 above). In our review of LEGO Hero Factory Surge 44008 we classed it as being suitable for ages 6 years, 7 years, 8 years, 9 years, over 10 years but recommend you check the manufacturer specific advice before purchasing.